Some peoples’ eyes maybe too big for their belly but, for the food-processing industry, the more capable the vision system the better the quality of the product that reaches consumers. Size, volume and health are all key ingredients for food that will be appealing to the buyer and the various imaging technologies used by the industry can provide this important information quickly. Food is mass-produced and the conveyer belt-based production systems require vision systems to work quickly at speeds of one metre per second or more. ‘One way for food processing companies to invest in new technologies, while seeing a demonstrable return on investment, is to make sure the inspection processes are rapid, accurate and repeatable. High throughput is key and is one of the main reasons to use hyperspectral imaging,’ says Kevin Lynch, European sales manager for US company Headwall. Hyperspectral cameras have the ability to capture an entire section of the electromagnetic spectrum with every pixel. ‘In the USA, where the majority of customers are, we’ve been looking at fruit and vegetable manufacturers – apples and tomatoes, that’s a big market – and meat and poultry,’ explains Lynch. Software is key to such analysis. ‘You have your basic software, but for each customer they will have their own differences. You have to apply those algorithms to the software; either we can do that, or the customer can. We are committed to working with the customer and getting it right,’ Lynch says. Headwall works with the US government’s Food and Drug Administration (FDA) to ensure the company’s products adhere to the FDA’s procedures. In April, Headwall opened a designated office in Europe. Lynch comments: ‘I am the first European employee; Headwall knows it needs to get closer to the customer, and that means having that service element. I hope that, in the next year or two, we will have more application scientists on board within Europe.’ Headwall always had resellers, but it is now up to Lynch to interact with them and develop sales and new channels, as well as looking at other market areas such as machine vision. Headwall views machine vision as a growing, complementary market area for hyperspectral imaging. As well as hyperspectral imaging, three dimensional analysis is also important to measure the quantity of produce. ‘Here in Spain we have coconut shells filled with coconut ice cream; it is a very typical ice cream in restaurants here,’ explains David Sabaté at 3D software provider, Aqsense. ‘You don’t know if the ice cream will fill it [the coconut shell], so we 3D scan the shell and classify it according to its inside volume.’ Aqsense provides 3D software complete with a 3D imaging library. ‘We provide the software and we can help customers choose the hardware, but we do not provide the hardware and the whole package,’ says Sabaté. As well as food, the drink industry has been another user of Aqsense’s technology. ‘We are still working on a project to inspect wine bottle corks. The cork has some parts that are black, due to the material, but they are not holes, they are dots,’ explains Sabaté. ‘Using our technology we can know where there is a real hole that leads to problems with sealing the bottle. You can scan the cork and detect where there are holes, or just black dots, to ensure the bottle is correctly closed and wine correctly stored.’ As well as corks, this sort of surface analysis can be used to examine cookies or chocolates to remove any products that have defects that would lead to customers not being satisfied. Cameras can also aid the computational process. ‘There are some 3D cameras that can do part of the processing,’ says Sabaté. ‘For example, we work with Automation Technology and Photonfocus cameras, which allow working at high frame rates because the camera is doing some 3D processing.’ In these camera models, the laser line detection is carried out in an on-board FPGA. This mixture of imaging techniques can be necessary at every stage of the production process. Sometimes it is necessary to avoid some quite destructive outcomes. Nilsson says that cans containing white beans have to be inspected to ensure they are properly sealed shut before they go into the oven. ‘If it is not closed during the cooking process, it can explode,’ he says. Another element of the pizza production process is slice quality. 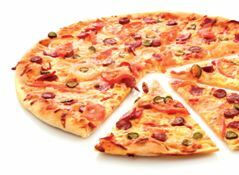 Each slice needs to have different elements of the pizza’s toppings to appear tasty to the consumer. ‘To make sure everything is looking nice, maybe you have a piece of salami that is supposed to be there. Every slice has to have something that looks tasty,’ says Nilsson. The type of processing of any one food can also dictate the speed at which imaging systems can be expected to analyse it. While products such as bottles will whizz past at one metre per second, according to Nilsson ‘It [food] can move very slowly because you want to bake it’. In Nilsson’s view the challenge is not so much with the camera but with the software. However, he recognises that, if the images are not good, then the software challenge can be unsolvable: ‘You have to ensure [you] always get good images. That is the key to everything.’ Those good images come from good lighting. ‘Clever light source arrangements and a good sensor are needed, but sometimes you have restrictions on how many sensors,’ says Nilsson. As companies can have space restrictions, adding sensors and cameras can be problematic. Sick’s solution is everything in one camera to ensure a good fit. ‘This is the beauty of combining everything into one camera; you save space,’ he says. Whether it is salami on pizza slices, coconut shell volume, meat inspection, vegetable freshness, or the consistency of pastry glaze, imaging systems are making sure that when the consumer opens that packet or box, the food is appealing – if not necessarily nutritious. Researchers at SINTEF Fisheries and Aquaculture, a Scandinavia research organisation, are working to automate fish processing in Norway to make it more economical. The aim is to stop fish being sent to low-cost countries such as China or in eastern Europe for filleting and packaging. In the last 40 years, the number of whitefish processing facilities in Norway has been reduced from 100 to just 10. Aursand and her team have started developing technologies and machines to make handling fish less work-intensive. These include a robot that can both bleed farmed fish and trim the fillets, as well as advanced camera technology and pattern-recognition used to analyse each fish as it passes along the line. Machine vision can assess: whether the fish on the production line is a cod or a saithe; any damage to the fish; and the weight of the fish in question, so that they can be sorted automatically into classes. Automation can also lead to major savings when it comes to manually-intensive operations such as bone removal and trimming. Machine vision can be used in almost all processes carried out in onshore facilities – from slaughtering, sorting, bone removal and filleting, to portioning and packing. A bonus resulting from the increased handling of raw fish in Norway will be that the processing industry will have greater access to waste raw materials. ‘Waste raw materials make up between 30 and 50 per cent of round fish mass and represent a significant source of protein, unsaturated fats and biochemicals – with added economic value,’ says Aursand. The researchers believe there is a need for an intensification of research into new processes, automation, and technologies linked to robotics, sensors and image processing. ‘The industry acknowledges the need for automation, and we researchers are ready to meet the challenges. It all depends on funding,’ Aursand adds.